The State Board of Master Electricians issues only one license, Master Electrician. In Maryland the actual performance license to perform electrical work is issued by each of the local jurisdictions. Many of the local jurisdictions do issue additional categories of electrical licenses. All of these licenses are lesser than a Master Electrician. For example some jurisdictions may issue a "general electrician", "limited electrician", or "low voltage" license as examples. If you are interested in obtaining a lesser license than a Master Electrician’s license, then you would need to contact the local jurisdiction where you would anticipate working and determine if they offer a lesser license and the qualifications. Not all jurisdictions offer a lesser license. In those jurisdictions that do not, an individual would need a Master Electrician’s license to perform any electrical work. Baltimore County offers their own license and examination policy. If you are a Master Electrician in the State of Maryland you only need to file your license with the county and will not need to take the county level examination. If you plan on doing work in Maryland in other counties in the future, holding the State Master Electricians license will afford you the ability to work in various counties. All applicants for a Master Electricians license must be regularly engaged in or employed to provide electrical services for all categories of electrical equipment for at least seven years, while under the direction and supervision of a master electrician. Unfortunately, Maryland does not offer reciprocity with California for this type of license. The Board issues licenses through reciprocity to individuals holding a current master electrician's license in the states of either Delaware, Virginia or West Virginia. 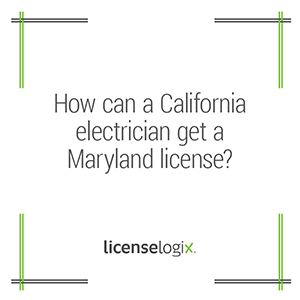 This license typically takes 7-21 days to be issued after the Maryland Board of Master Electricians receives the final application, if no deficiencies are found. To ensure your license application is filled out properly and to avoid delays in processing your application, LicenseLogix can prepare and file all the paperwork in this application process, while providing guidance and support to ensure your license is issued as quickly as possible. If you have questions about which type of license you need, you can contact a licensing expert by clicking contact us, or give us a call at (800) 292-0909.